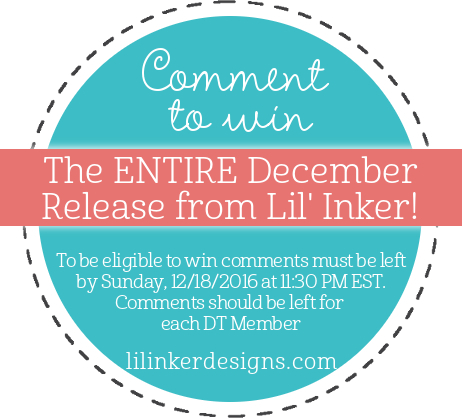 Angel's Creative World: Lil Inker Designs New Release Blog Hop - Day 1! 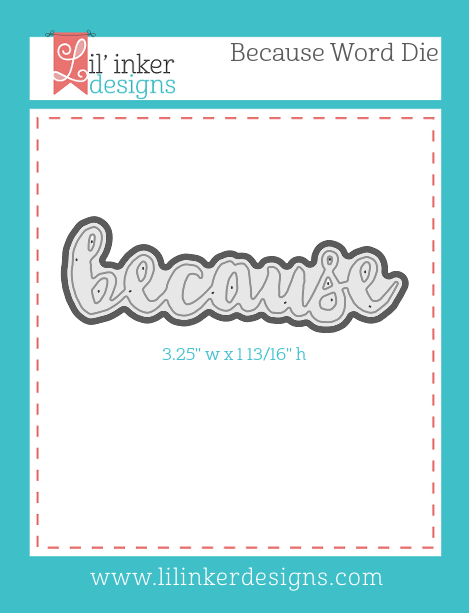 Lil Inker Designs New Release Blog Hop - Day 1! I'm going to get right to it because we have quite a bit of eye candy for you! My card today features the Corner Adorner stamp set and the Because word die. Just LOOK at that flower stamp! GAHHH! I embossed it with gold embossing powder then colored in the image with various colors of metallic watercolors. 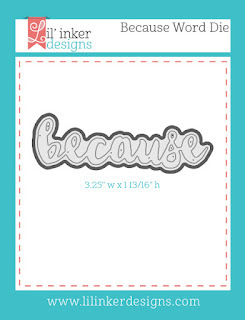 The 'because' was cut out 3 times for extra dimension, then layered over a sentiment from the Corner Adorner set. The top layer is a light purple card stock (Grapesicle) to accentuate the purple in some of the flowers. I seriously can't tell you how much I love that Corner Adorner set!!! And you know what the good news is??? The entire release is available in the store NOW!!! And that's not all! Please comment as you hop along because you have a chance to win the ENTIRE RELEASE! WHAAAATTTT?!! Wow! The way you have colored the image makes it look like a piece of rich, embroidered silk fabric. Looks absolutely amazing. Holy cow! 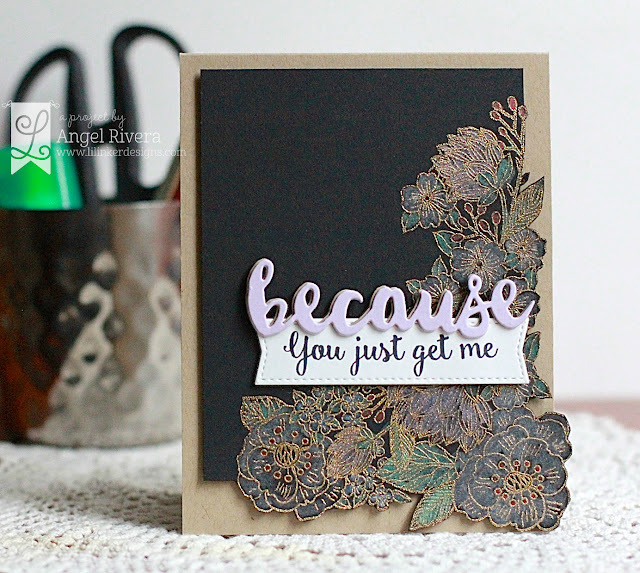 Love love love the drama of the embossing powder and the metallic watercolors against the black. I so have to try that! Holy Cow! I love love love all that metallic against the black. I so have to try that. Love your card. Your coloring of the flowers is really beautiful. I like the Corner Adorner and how you colored it. I think it will be a wonderful stamp to have. Stunningly beautiful, Angel!! Well done! Beautiful card! Love the colors you chose. Gorgeous card! Love love love that stamp set! Great card! Love the coloring of the stamped image, elegant. Wow. That is all I can say about your card. Stunning!!! That corner adorner is amazing!!! 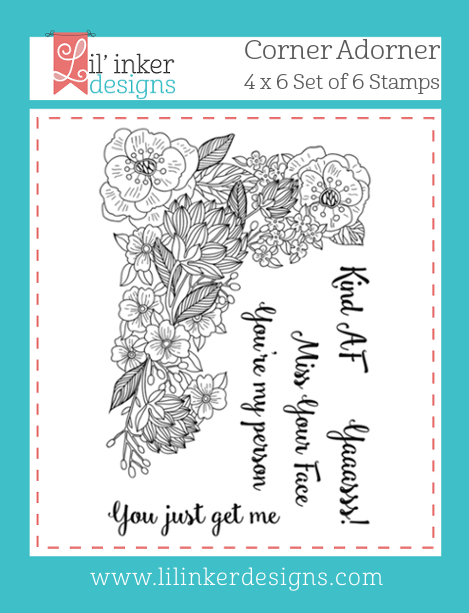 I really like the phrases in this stamp set as much as the floral border! When I read the words, I instantly thought of the people in my life they would perfectly suit. Oh my goodness Angel, this card is truly STUNNING! What a beautiful set! Wonderful card! Love the metallic with the black & Grapesicle colors. Love it when someones cuts more than one die for the dimension. Beautiful work with those beautiful products! The Corner Adorner stamp is absolutely gorgeous! Love your beautiful card! Awesome coloring! Oh wow! Stunning card and amazing release!!! Wow your card is elegant. I like the coloring. What an amazing card! It's totally stunning with the black and the colors! Love the gold embossing on the black. Very nice. Gorgeous! I love what you did with that lovely corner adorner stamp. It has so many possibilities. Such a cool card! I am loving the looks of this new release! So awesome! Wow, such a cool look with the dark background! This is so elegant with the gold embossing and metallic watercoloring. This is so strikingly beautiful... it literally took my breath away!! Your card is absolutely stunning and elegant. This is a beautiful stamp set. What an elegant looking card. Just beautiful. The corner adorner is one of my favourite stamps. Just beautiful! Wow the way you did the flower corner is fab and such a great idea!